ParisDailyPhoto: Happy (Chinese) new year! OMG, to think I just mentioned Chinatown yesterday as an attraction to visit!!!! Were you at place d'italie? Love the pix within a pix. @PHX. Yes I went to Place d'Italie, especially for the occasion. The Year of the Rabbit, I believe. A couple years ago the Mpls. Institute of Arts had a celebratiion with a dragon and dancers parading around the corridors. It was really fun to see. I am not a big fan of parades, but the Chinese New Year parades are so colorful and full of energy, I like them. Love the way you "captured" the parade, Eric (copyrights be damned)! Xin Nian Kuai Le to you. A picture within a picture within a picture within a.....well you get the idea! Happy Year of the Rabbit indeed!!! 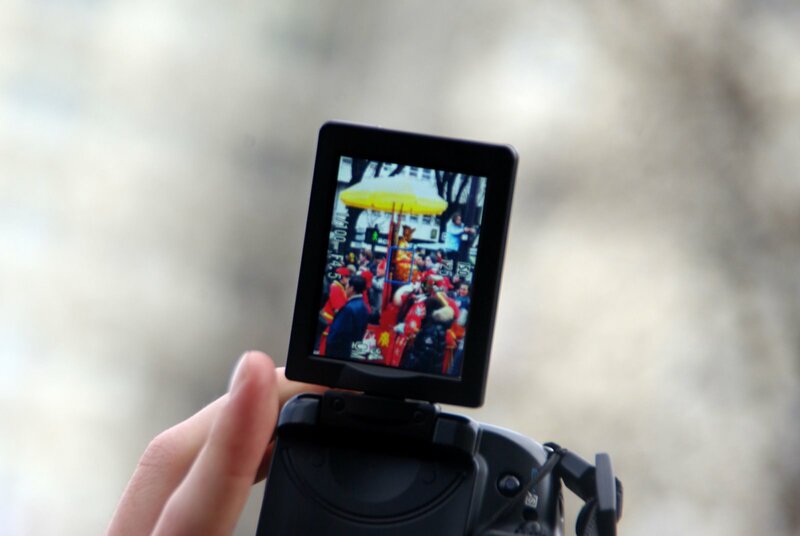 :-) Love the idea of the "borrowed" camera shot: the colorful parade nicely kept inside the black frame! Thanks for going and showing us a new view of Paris, Eric. Happy New Year! Helo, I am copyrite lawyer. You imfringe my photo coypuwrite. Send 500 yuro right way. You NO do AGAIN, DRUMMOND! Fantastic photo! The most amazing minimalist mise-en-scene. I know there's a parade here, or does it exist only in the photographer's mind??? Anyway, the first day of the new chinese year, so the rabbit one, was a lot sunny in Paris. A nice preview of what is ahead us in the north hemisphere at least. Bettina, LOOOOL ! I think I got you very well !! !